The Whistler range of single malts are a great new series of whiskeys produced by the Boann Distillery. These bottlings have all been finished in quality oloroso sherry casks and we have been very impressed with the three different bottlings. 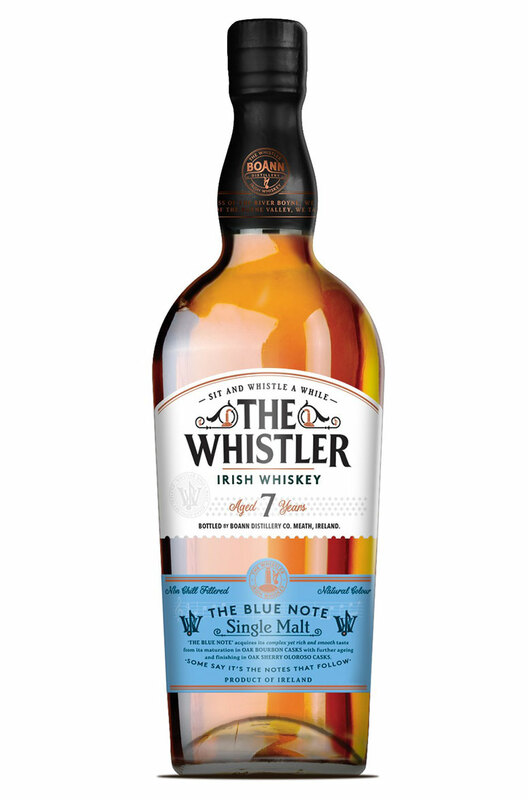 This 7 year old 'The Blue Note' is the core expression and is also joined by a 10 year old and a 7 year old cask strength. Nose Warm and inviting with autumnal aromas, dried fruits, dates, figs, fruit cake, salted caramels and mocha. Palate Fresh and fruit laden with flavours of sultanas, dried apricots, lemon cake and orange peel. The finish is more savoury with salty, bready notes. The Whistler 10 Year Old is a great tasting single malt with lots of sherry cask character. This has.. It would be hard to pick a favourite in the Whistler range of whiskeys as they are all very good but.. The first of three cask finished blends from the Boann Distillery's 'Whistler Irish Whiskey ..